I am a serious nerd. I grew up on J.R.R. Tolkein and played Dungeons and Dragons all through high school. Trekkie conventions, RPGs, Renaissance festivals, you name it. I had the punch mark on my Geek Card. I still remember being 3 years old standing in line with my father and uncle for hours as we eagerly waited to see this new epic film…Star Wars. Two hours later, I was hooked. I grew up ankle deep in action figures, and logged so many gaming hours on Atari’s The Empire Strikes Back that even my dreams were pixilated. So when George Lucas announced, many years later, that he would be releasing the prequels to Star Wars, I was soooo excited. But please don’t hate me. So sorry, but I just didn’t like the prequels. I have tried to watch them many different times and yet found my mind wandering. I couldn’t keep up with what was going on and I felt, in some way, that I had failed. Maybe I wasn’t a true geek after all. Maybe I would have to turn in my Geek Card. So this last Memorial Day weekend, I decided to give it another college try. Maybe this time things would be different. Nope…still didn’t like them. Ah, but this time I had a new perspective since I have spent the past two years blogging about writing. What went wrong? What can we as writers learn from this? Episodes 4-6 remain brilliant examples of storytelling genius, so what happened with the prequels? I think the business of making money took precedence over solid storytelling. The movies were a huge success for their purpose—filling lots of seats and selling loads of merchandise. But, in a way, it saddened me because these movies could have set a new bar in master storytelling. As writers, we can learn a lot from these movies. Mistake #1 Bad guy’s plan was far too complicated. If you need to use a Venn diagram to explain the bad guy’s agenda, then your plan is too complicated. I STILL don’t know what the Emperor’s plan was. Maybe I am missing something, but it seems to me that Senator Palpatine’s plan rested way too much on chance. What if Queen Padme Amidala had not given the vote of no confidence that started the ball rolling? Truly great bad guys don’t base their plans on a craps shoot. I still am not quite sure who ordered the clone army. If Palpatine ordered the clones, then he was pitting them against the droids…which he was controlling as well???? Huh? And then, if the clones were created off the bounty hunter Jango Fett to be an army for the Republic to fight the rebels, then why, when Obi-Wan discovered the clone planet, did Jango Fett go running to hang out with the leader of the rebels, Count Dooku? The guy in charge of the droids? Which are about to be attacked by the clones? This either makes Jango Fett the dumbest guy in the known universe or Count Dooku the biggest patsy in the known universe. Neither is really good for the purposes of storytelling. I am certainly no one when it comes to the ways of business in Hollywood, but it seems to me that if you want to make millions off selling action figures to kids, it would be a plus if they could understand the point of the story. Star Wars was not complicated. It was complex. It was brilliant storytelling and the bad guy’s agenda could be summed up in one sentence. It was so simple even a kid could understand it. Mistake #2 Heroes are not babies, and bad guys are not whiners. OMG…I wanted to SLAP Anakin Skywalker. If the end goal was to make Anakin into DARTH VADER the greatest bad guy EVER…then no whining. Scene after scene of Obi-Wan just doesn’t take me seriously got old really quickly. Yes, as writers it is a great goal to have flawed heroes, because perfect characters lack depth. But, I feel there are certain character attributes that will alienate fans. Whining is one of those. If we lay the movies out in order, the story is really about Anakin Skywalker. It is supposed to be a redemption story. That is fine so long as we care to see the protagonist redeemed. The whining was bad enough, but when Anakin-turned-dark killed the Younglings? I was done. May hordes of a thousand fleas infest his undies. I hoped he died a horrible death from that point on. To me, there was no redeeming him. He was a Little Kid Killer. What is sad is that the scene was shock value, not good writing. In my world, where I get to write the prequels? Darth Maul would be threaded through all three movies. He was an AWESOME bad guy who got killed off far too soon and, frankly, far too easily. There was no reason that Darth Maul could not have made it to movie three. In this parallel universe where Hollywood cares about my opinion, Anakin could have still been on the fence, wavering—Dark Side or Light Side? Dark or Light? Go Dark and save my love? Trust the Light, but risk that she dies? The Emperor, in that final full-court press, could have ordered Darth Maul kill the Younglings, and then Obi-Wan could have killed Darth Maul. We would have seen this coming. Darth Maul looked like a Little Kid Killer from the beginning, and we’d be happy Obi-Wan sliced him in half. Little Kid Killer. Take THAT! Anakin could have unwittingly aided Darth Maul in this horrible act, and, feeling he had done the unforgivable, finally committed to the Dark Side—making it a classic Prodigal Son story. We would have felt for Anakin, for his belief that he could never make things right. We would have sat on the edge of our seats, longing for him to make amends and come home. There was no reason for Anakin to kill little kids other than to shock the audience. And don’t get me started on Padme. Really. She is this awesome heroine in the first movie. She’s a warrior and a stateswoman. In movie three we die of…a broken heart? Seriously? Two BABIES are not enough for her to press on? For me, this was totally out of character for the Padme presented, rendering the final funeral scene contrived melodrama. It didn’t ring true. Characters can act out of character. They shouldn’t be predictable, but there is a fine line that will rip apart believability if we cross it. Mistake #4 Too many characters. I am certain things work differently in Hollywood. I know there is a lot of merchandising that rakes in buckets of cash to fund payroll and overhead. That’s fine, but we writers can still learn. The prequels had characters for the sake of having characters. The problem with a super huge cast is that it is far harder for us to connect emotionally. We have too many “people” vying for our attention. My opinion? Jar Jar Binks was dead weight. He was like trying to go into battle with a hybrid of Ace Ventura meets Rain Man. Why would Qui-Gon take a loose cannon like that along? Jar Jar Binks was a moron and a walking danger to everyone on the team. Comic relief? Perhaps. But it was a stretch…especially in Episode 3 when he is now a politician? The same guy who stuck his head in an energy beam? I feel there were some really fascinating characters—Qui-Gon Jinn and Darth Maul—that were killed off far too early when there was no need…other than to introduce brand new characters so we could have more action figures to sell. The end result of crowding the cast was that the key characters got far too little attention, so we couldn’t watch their arc progress. Thus the actions seemed contrived and forced. The lesson here? Be careful how many characters you slate in your novel. Movies get more leeway because we can see the characters. We don’t have to learn their names to keep up with the story. I have edited many pieces where they author has a half a dozen characters introduced on page one. This will give the same effect. It will overwhelm the reader and dilute their concern for major players…just like in the Star Wars prequels. Mistake #5 Characters should progress naturally. Characters’ wants and needs need to grow logically and organically out of the conflict and be in line with the character’s personality. They shouldn’t feel things and decide thinks simply because we, the writer, need them to. I felt this was the case with the doomed love affair between Padme and Anakin. It felt forced. The writers needed them to be stupid so that Anakin going to the Dark Side would make sense (which it still didn’t). The problem was that they had created a heroine who was far too pragmatic and self-sacrificing to turn into some mindless ninny. She was the type of leader who was unafraid to get in the mix and to do what was best for her people. She wasn’t some vapid, self-centered socialite, so why did they suddenly have Padme acting like one? Because they needed her to. Anakin was adorable in the first movie, but by the second we knew that sniveling rat would sell out at the first opportunity. What on earth would a powerful woman like Padme find attractive about a guy who spends most of his time with her complaining about Obi-Wan? It’s like Jersey Shores goes to Tatooine. Blech. Most of the other interesting characters either DIED before we could see a progression OR they got so little screen time—had to make room for C-3P0 and R2D2 banter—that we just missed it. Obi-Wan might have been a really great character…had we ever gotten to know him. Mistake #6 Don’t explain everything. Sometimes the magic is in the audience not knowing. Think of a magician. When a magician makes a woman float in the air, all the audience wants to know HOW he did it. But what if the magician stopped the show and gave them what they wanted, and said, “Oh she isn’t really floating, she’s just held up by super strong filament”? That would ruin the magic and likely the magician’s career. We all want a little magic, and with Star Wars, The Force was mystical, mysterious and magical…until the writers explained The Force as sentient microcells known as Metachlorians. If you have super-technology, magic, ghosts, or anything far-out in your stories, don’t feel the need to explain. The second a reader picks up your books, she has suspended disbelief so you don’t need to spend precious story time making her believe. She already does. We believed in The Force long before anyone concocted a Metachlorian, and many of us wish they hadn’t. Ah, but these 6 problems are all symptoms of a plot that has no core conflict—back to mistake #1. All the problems in the movie stemmed from the simple fact that the Emperor didn’t have a simple plan with clear objectives. Thus, what happened was that the story needed to get more and more complicated to make up for the fact that it was missing a core conflict. The Star Wars writers were trying to fix plot holes with Narrative Bond-O—more world-building, more characters, more subplots, Metachlorians— and the story got more and more complicated all to make up for something that would have been fairly easy to fix had they stuck to the rules of good storytelling. The writers needed to simplify the bad guy’s plan. Had Palpatine/Darth Sidius had a simple plan, the story would have then been able to be complex. See, in the movies we grew up with? Star Wars, The Emperor Strikes Back, Return of the Jedi—the antagonist’s objective was crystal clear and so simple a 4 year old could understand it. That left room to develop characters that will live on forever. Writers will study these stories for generations to come. So what do you guys think? Did you love the movies and I missed something? Tell me what you loved. Did you have the same experience? Were you disappointed? Why? What do you feel could have improved the movies? I love hearing from you! And to prove it and show my love, for the month of June, everyone who leaves a comment I will put your name in a hat. If you comment and link back to my blog on your blog, you get your name in the hat twice. If you leave a comment, and link back to my blog, and mention my book We Are Not Alone in your blog…you get your name in the hat THREE times. What do you win? The unvarnished truth from yours truly. Structure Part 5–Keeping Focused & Nailing the Pitch–Understand Your "Seed Idea"
Welcome to the 5th installation on the topic of structure. As an editor for years, I consider myself an expert in spotting and fixing structural problems. Sadly, over the course of doing this many years, I have run into far too many novels that had plot problems that ran so deep there was no saving the manuscript. Like a building with massive structural flaws, the best course of action was simply implosion. Rebuild. Start from scratch. I used to try to teach from the perspective of an editor, but I found that my thinking was flawed. Why? Because editors are like building inspectors. We have skills best used on a finished product. We are trained to look for problems. Is that a good skill? Sure. But do building inspectors design buildings? No. Architects do. Architects employ creativity and vision to create a final structure. Hopefully, they will have the necessary skills to create and design a structure that will meet code standards. Creativity and vision are not enough. Architects need to learn mathematics and physics. They need to understand that a picture window might be real pretty, but if they put that sucker in a load-bearing wall, they won’t pass inspection and that they even risk a fatal collapse. This made me step back and learn to become an architect. When it comes to plotting, I hope to teach you guys how to have the creative vision of the designer, but with the practical understanding of an inspector. Week one, we discussed plot on a micro-scale. Week two we panned back for an aerial shot, and discussed common plot problems that arise from a flawed structure. Week three we discussed the single most important component to plot, the Big Boss Troublemaker, and last week I gave you a tested method to make sure your core idea was solid enough to be the foundation for an entire novel. Today I am going to show you how to construct your novel’s core—the log-line. I learned this tactic from NY Times Best-Selling Author Bob Mayer. If you can ever get the opportunity to take his novel writing workshop, please do. It will change your entire career. Good log-lines exude inherent conflict. Conflict is interesting. Blake Snyder talks about taking his log-line with him to Starbucks and asking strangers what they thought about his idea. This is a great exercise for your novel. Pitch to friends, family, and even total strangers and watch their reaction. Did their eyes glaze over? Did the smile seem polite or forced? If you can boil your book down into one sentence that generates excitement for the regular person, then you know you are on a solid path for your novel. Yet, if your potential audience looks confused or bored or lost, then you know it is time to go back to the drawing board. But the good news is this; you just have to fix ONE sentence. You don’t have to go rewrite, revise a novel that is confusing, convoluted, boring, arcane, ridiculous, etc. Bob Mayer taught me this tactic a couple of years ago and it WORKS. In my novel writing workshop, every participant has to be able to tell what their story is about in ONE sentence before we ever start plotting. If the writer gets too far off track, then we as his teammates know to do one of two things. 1) Change the plot and get back on track. Remember the core idea. Or 2) Change the original idea. Fear is probably the most common emotion shared by writers. The newer you are the more fear you will feel. A side-effect of fear is to emotionally distance from the source of our discomfort. The log-line will help you spot that emotional distancing and root it out early. I have seen two behaviors in all my time working with writers. Either a writer will wander off down the daffodil trail because he is afraid he lacks the skills to tell the story laid out in the log-line, OR the writer will water down the log-line to begin with. Through future plotting the writer will realize hidden strength…then he can go revise the plotting or revise the log-line. I feel a good novel log-line will have 1) your protagonist 2) active verb 3) active goal 4) antagonist. 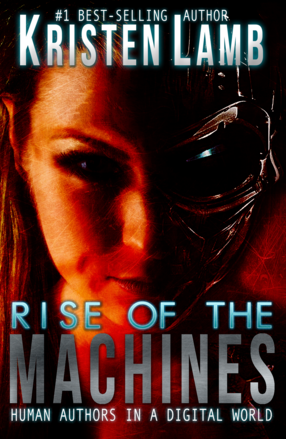 An out-of-work computer programmer (protagonist) must uncover (active verb) the secrets his wife is keeping in order to destroy (active goal) the nano-robotic threat (antagonist) to human-kind. So here is an exercise. See if you can state your novel in one sentence. It will not only help add clarity to your writing and keep you on track, but when it comes time to pitch an agent, you will be well-prepared and ready to knock it out of the park. What are some problems you might be having? Share in the comments. Maybe you have a tactic or a resource you would like to recommend. I love hearing from you guys. If you want to build the kind of platform agents are looking for, then buy the book agents recommend. We Are Not Alone–The Writer’s Guide to Social Media is an essential for every writer who wants to succeed in the new paradigm of publishing. My book will show you how to build a platform designed to connect with READERS and still have time left over to write great books….oh, and sleep and bathe and have a life.